I love granola. My mom used to buy the Heartland brand of granola (cereal) when we were kids. I remember it had very plump raisins and the trick was to hurry up and eat it as quickly as you could before it sucked up all your milk. It’s been a long time since I’ve had a bowl of that granola. I actually thought the company went out of business years ago because boxes of Quaker, Sunbelt and Kellogg’s granola monopolized every cereal shelf in every grocery store where I shopped. Then one day, whilst perusing the ‘take out a second mortgage to shop here’ aisles, I noticed that Heartland was still making granola and I was so excited I sent my sister a text. She was excited, I was excited, and it was a good day for granola lovers everywhere. After all that excitement, I didn’t buy any Heartland Granola. Why? 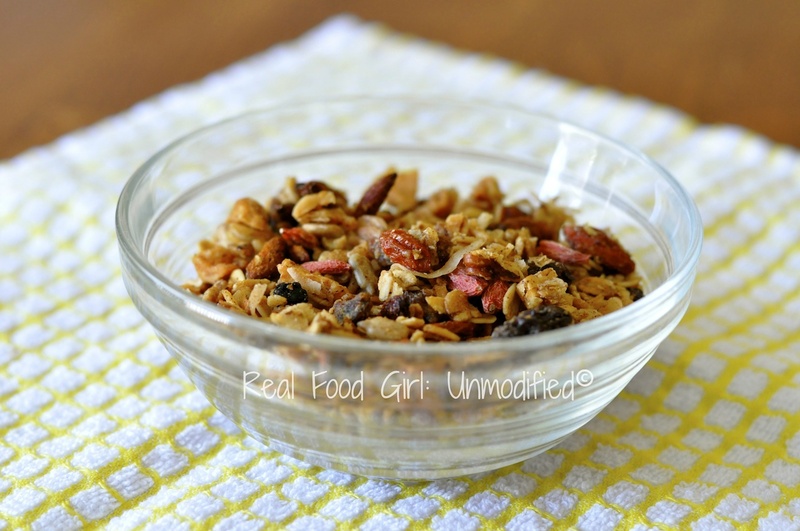 Well, because I’ve been making my own granola for a couple years and personally I like it better. I can pimp it up anyway I want! You’ve seen the show Pimp My Ride, where they deck out someone’s car and add all sorts of insane, custom details and parts. By the time they get done with the car you hardly recognize it, and if you parked it on a vacant lot the thing would earn equity. Homemade granola is sort of like that minus the earning equity part. You get to add whatever you want. 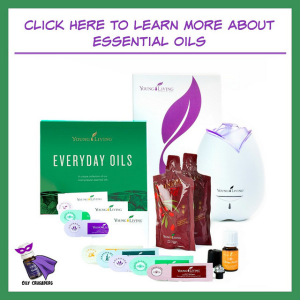 You can add as many nuts, dried fruit, honey, coconut, maple syrup, oats, the possibilities are endless, just like the hearing loss some of those people obtained after turning on their $15,000 custom stereo system complete with concert speakers and a 400-pound sub-woofer. Is it just me, or whenever you see the word sub-woofer you feel obligated to say “Who let the dogs out?” “Woof, woof, woof!” ?? Just me? Alrighty then. It’s just me. I don’t have a recipe for this granola. Every time I make it I just throw stuff into a bowl, toss in whichever sweetener I have on hand, and bake it until it looks GBD (Golden Brown Delicious), let it cool, then store it in an airtight container. TSM likes to eat it as a snack with some juice, and we also eat it for breakfast and it tastes really good in a homemade fresh fruit and yogurt parfait. Hmmm, I should make one of those for breakfast tomorrow. My measurements are guesstimates. This recipe depends on your personal likes and dislikes. The only thing in this recipe that stays approximately the same is the honey and butter mixture. Sometimes I use pure maple syrup instead of honey, but the amounts stay roughly the same unless I’m making a much smaller batch. **NOTE– If you don’t feel like buying separate bags of the *barley, *steel cut oats, and the *rye, Bob’s Red Mill carries a product called Museli, which has oats, barley, rye, raisins, dates and sunflower seeds in it- it’s basically premade granola without the extras or the honey. When I’ve been in a pinch, I will buy some of that, and substitute 2 cups of museli with the 4-1/2 cups rolled oats for the other three grains. 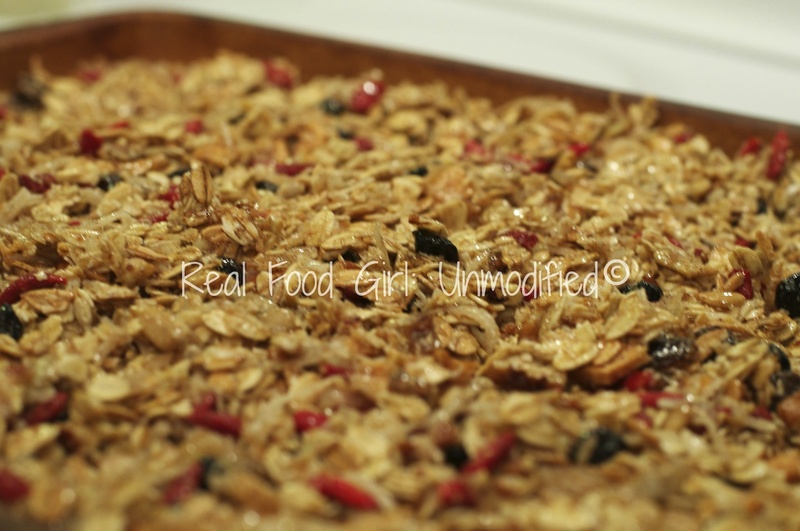 I use an 11×17 stone baking sheet (jelly roll pan, aka half sheet pan) for this recipe because I find the granola bakes more evenly, and I have fewer hot spots. If you do not own a stone bakeware piece like this, you can cover your baking sheet with a piece of parchment. 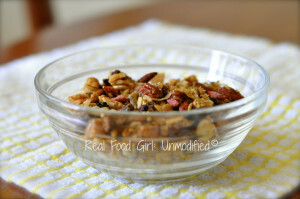 In a large bowl, combine all the oats, grains, nuts, seeds, dried fruit, coconut and spices. Give it a gently stir to combine everything. In a small saucepan heat the butter, honey and salt over low heat. Once the butter melts, add the vanilla. Pour the hot butter-honey mixture over the dry ingredients and stir until everything is evenly coated. Spread mixture onto your baking sheet in one even layer. Don’t pack it tightly. Bake for 60 to 75 minutes. 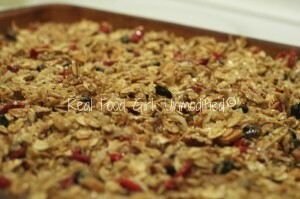 I stir my granola about 30 minutes into the baking time and then rotate the pan. 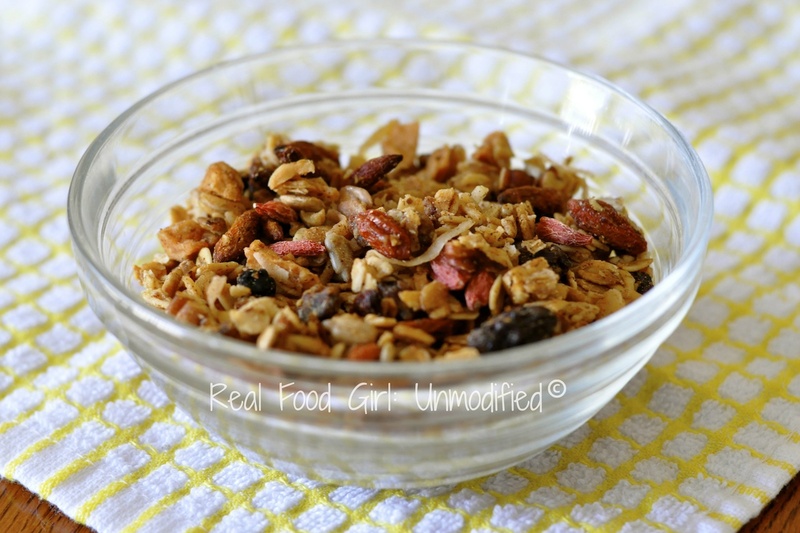 The granola becomes crisp as it cools. Sometimes I get some nice big chunks, other times I don’t get many. Depends. You can break up your granola by hand, and store it in an airtight container for up to 2 weeks. It won’t last that long! Read labels is my best advice. I’ve had to look at over 7 stores and I think I finally caved and bought craisins with sugar, because in the grand scheme of things, it’s not that much sugar. If you are unable to find organic dried fruit without sugar in your area, you could always dry your own fruit in your oven. Set the oven at the lowest temp and dry the fruit over several hours…I was able to find most of the fruits without added sugar at my co op and Trader Joe’s. Do you have any suggestions for finding the fruit without sugar? I also have a child with a peanut allergy, but can leave the nuts out … looks delish!